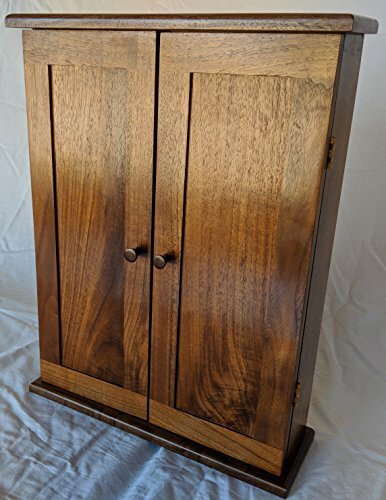 Jewelry Cabinet made from Walnut by Steven Ashly Designs at Nicky's Blog. Hurry! Limited time offer. Offer valid only while supplies last. This jewelry cabinet is built entirely from walnut, including a walnut veneer plywood for the back. It measures 17'' high, about 13'' wide and 4'' deep. This jewelry cabinet is built entirely from walnut, including a walnut veneer plywood for the back. It measures 17" high, about 13" wide and 4" deep. The doors are true frame and panel construction with book-matched panels, hung on brass hinges and held closed with small rare-earth magnets. The door knobs are hand-turned on a miniature lathe. To add character, I try to create different style knobs for all my cabinets, so each is unique. Inside, there are 48 earring holders, and nine hand-turned hangers capable of holding multiple necklaces. The cabinet is traditionally finished with multiple coats of shellac to bring out the natural beauty of the figured walnut. The cabinet can be hung on a wall (anchors and screws are included), but it also works well as a free standing unit and could be placed on a dresser or nightstand. If you have any questions about this product by Steven Ashly Designs, contact us by completing and submitting the form below. If you are looking for a specif part number, please include it with your message.